Posted on Sun, Feb 28, 2010 : 5:55 a.m.
Paul Courant, the dean of Libraries at the University of Michigan, sits in front of a card catalog in the stacks of the Hatcher Graduate Library. So it will be said about the University of Michigan Library's card catalogs when they are removed from their home in the bowels of the Harlan Hatcher Graduate Library on March 8. Twelve and a half million volumes strong, the card catalog has been in disuse for more than 20 years, ever since the university established the MIRLYN electronic catalog in 1988. By 1991, every book in the library system had been catalogued onto MIRLYN, and the card catalogs were a relic of the past. 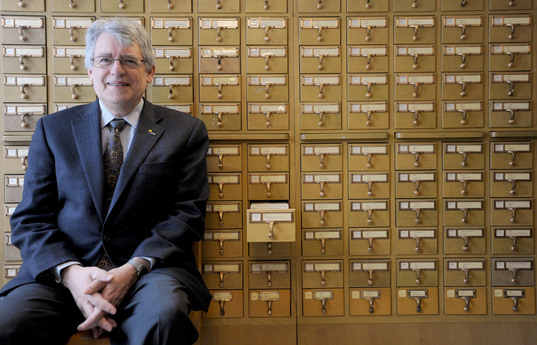 "I'm sad to see them go," said Paul Courant, U-M's Dean of Libraries. "This is truly the end of an era. But it is time to move on." "This is a beautiful space," Courant said from the basement of the grad library, where the catalogs will remain until study tables and additional seating replace them. "This building is full of people, all day and all night long. Students want and need places to work - keeping 108 big, unused boxes out in areas better used for study is just not efficient." Even if it is tradition. That the university kept the card catalogs around more than two decades after they outlived their usefulness is a testament to the importance of their sentimental value. Card catalogs located in the stacks of the Hatcher Graduate Library. Next stop for the majority of the card catalogs is U-M Property Disposition on North Campus, where the university will attempt to sell the old catalogs one by one. Courant said he isn't quite sure who is in the market for these pieces of library nostalgia. But, he added, "if I had the room in my house, I'd buy one." Courant also discussed the ongoing Michigan Digitization Project to digitize the university's seven million volumes. Google has scanned approximately 5 million of the university's books, and scans about 30,000 a week. Already, Google has scanned in books from the Shapiro Undergraduate Library, the grad library, the Buhr shelving facility and others. The project should be completed in 2011, making millions of books available to the university community and the general public via the Internet. Courant also said that the infamous stacks in the grad library might be on their way out, too, years down the road. As books become increasingly available online and readers read more of their books online - not to mention the constant demand for more study space - maintaining stacks isn't the best use of the university's resources, he said. But the stacks are load-bearing. Full-scale removal and replacement with study space could require costly renovations. Courant said that repurposing the stacks, removing commonly available books and making them home to archival resources, is another option. 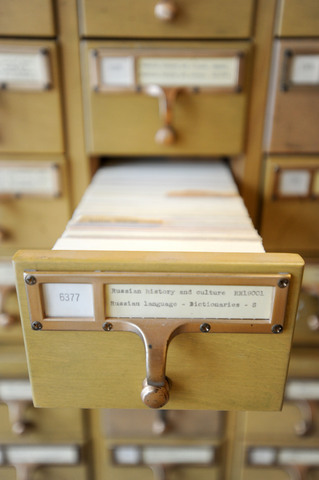 Courant did throw a bone to history lovers who will bemoan the end of the card catalog era: U-M will keep one card catalog around for old time's sake, filled with drawers pertaining to the state of Michigan and the University of Michigan. It will likely reside in the Library Gallery on the first floor of the grad lbrary, off the diag (north) side. The former University of Michigan provost envisions the last remaining card catalog as a museum piece, one that will allow students to understand how their predecessors did research in a world before computers. "Interested younger people will be able to look at the old system as librarians explain that 'this is the way it used to be,'" said Courant. Tue, Mar 2, 2010 : 2:07 p.m.
Don't worry...you'll still need your knowledge of Dewey to actually FIND the books you look up in the catalog on the shelves. Tue, Mar 2, 2010 : 12:26 a.m. I'm still ticked that I spent all that time in 2nd grade learning the dewey decimal system only to have all that time go to waste. what a joke. Sun, Feb 28, 2010 : 7:12 a.m.